What are the different types of Gooseneck Hitches? 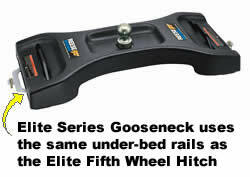 Above-Bed installation - Above-Bed Gooseneck Hitches mount to the same rails as a Fifth Wheel Hitch. 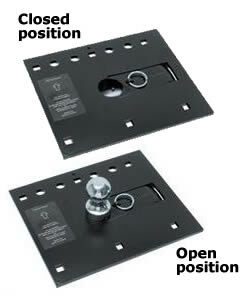 This type of Gooseneck Hitch can be easily removed and installed as needed. Under-Bed installation - Under-Bed Gooseneck Hitches are the most popular style of gooseneck on the market today. These hitches are custom fit to your specific vehicle and have rails that attach under the bed of the pickup to support the gooseneck head. Depending on the brand of hitch selected, the ball can be removed or lowered when not in use. 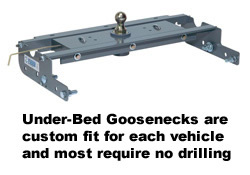 We offer Under-Bed Gooseneck Hitches by all the top manufacturers including B&W, Draw-Tite, Pop-Up and Blue Ox. All require only a 4" hole in the truck bed and most require no drilling of the vehicle frame to install. 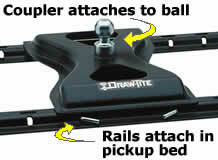 Fold Down installation - Like the under-bed hitch, the Fold Down Gooseneck uses rails under the pickup bed but differs because the hitch ball itself is mounted on a plate in the bed. Unlike the under-bed hitch, it requires a much larger hole in the pickup bed for installation. When not in use, the ball folds down for full use of the pickup bed. Custom fit installation rails are available for most applications and are sold separately. Data generated in 0.00228 (s) from 6 queries.